Picture courtesy of Hans Henrik Larsen, Copenhagen. 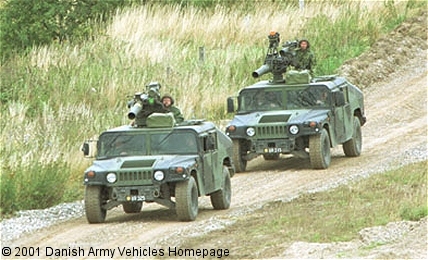 Danish Army Specific: After trials in 1998 - 99 the HMMWV was chosen to supersede the Land-Rover 88 as platform for the TOW-launcher. 30 vehicles, which have replaced 60 Land-Rovers, were delivered via Hägglunds Vehicle AB in Sweden. The first "real" HMMWV to be implemented in the Danish Army. The system was phased out without replacement in year 2010. Historical: Based on the draft specification for the High-Mobility-Multipurpose-Wheeled-Vehicle (HMMWV) issued by the US Army in 1979. 3 companies, AM General, Teledyne and Chrysler Defense were contenders for the contract. Each company delivered 11 prototypes for evaluation in 1982. Food Machinery Corporation (FMC) intended to submit a prototype, but due to other commitments was eventually forces to withdraw. After extensive testing and evaluation, AM General was awarded an initial contract for 2.334 vehicles. First five-year contract, which called for 55.000 vehicles in different configurations, was awarded by the US Army Tank-Automotive command on March 22 1983. The value of the contract was around $1.2 billion. Large scale production started at the AM General production facility in Mishawaka, Indiana in 1983, and production vehicles started to enter service in late 1983/early 1984. In 1989 another five-year contract was issued covering 33.000 vehicles. In 1994 AM General began production of an "A1" upgraded series of vehicles, using the heavier M1097 chassis. Among other improvements were new front seats, handbrake lever, glow-plug controller and up-graded rear half-shafts. The "A2" series appeared in 1995. Among the changes was a 6.500 cm3 engine developing 160 hp and an electronically controlled 4-speed automatic transmission. Also rear seats similar to the A1-series front seats were added. The vehicle was build as "CTIS-ready" - ready to accept a central tire inflation system. Development of an "A3" series, which includes a new engine and addition of an anti-lock brake system, started in late year 2000. Total production by the beginning of year 2004 was more than 160.000 vehicles. The HMMWV replaced among others the M151, the M274 Mule and the M561 Gama Goat in the US armed Forces. Length: 4.84 m (188 inches). Width: 2.55 m (99 inches). Height: 1.83 m (71 inches). Weight: 4.900 kg (10.780 lb.). Engine: GM V8-cylinder, 6.500 cm3 (396 cubic inches) displacement, water cooled, fuel injection. Horsepower: 159 at 3.400 rpm. without preparation: 0.76 m (30 inches). with deep water fording kit: 1.52 m (60 inches). Tyres: 37 x 12.5 - R16.5LT. Fuel capacity: 95 liter (21 gallons). Armament: 147 mm TOW-launcher. 6 reload missiles are carried in the cargo compartment. The missiles carries a high-explosive, armour-piercing, shaped-charge warhead that when its hits an enemy tank, produces a concentrated heat stream that can burn through all but the latest composite armour. The crew can rapidly dismount the system for ground use, if needed. Additional: The M1045A2 is one of the TOW Missile Carrier configurations of the HMMWV family. The vehicle is equipped with supplemental armour and TOW launcher mounted on the roof of the vehicle. The vehicle is used to transport and launch TOW missiles to defeat armoured vehicles. The weapons platform can be traversed 360 degrees and the launcher elevated to 20 degrees and depressed to 10 degrees. All vehicles are equipped with VHF-radios. The vehicle can climb 60% slopes and traverse a side slope of up to 40% fully loaded. The M1045A2 model has the latest modifications applied to the vehicle. Equipped with Webasto diesel-powered engine-heater.